Mr. Delaney launches ‘Connect Tipperary’ this Thursday night, November 26, a people power programme backed by ConnectIreland which aims to bring expanding international firms to Tipperary Town and its surrounding hinterland over the coming years by networking with growing global firms and selling Tipperary to them as a European base. ConnectIreland is the brainchild of award-winning entrepreneur, Terry Clune, of Taxback.com and working in conjunction with IDA Ireland under the Government’s ‘Succeed in Ireland Initiative’, it already has announced over 1,600 jobs in 12 counties throughout Ireland over the past three years. Connect Tipperary offers a unique opportunity for Tipperary people at home and all over the globe to be its eyes and ears, its Ambassadors and its champions and support and promote West Tipperary as an ideal place to do business, according to Business Development Officer with Tipperary County Council, Anthony Fitzgerald. “We’ve teamed up with some fantastic ambassadors, among them John Delaney, Aidan O’Brien and his team at Coolmore and others to work their connections abroad and really promote this region as the perfect place to grow a business. “We’re launching in Tipperary Town on the 26th and hope that business people, communities, clubs, community representatives and anyone interested in promoting this region will come along, sign up as ‘connectors’ and learn how they can play their part in reinvigorating this region while earning a cash reward of up to €1,500 per job delivered. “Tipperary Co-Op have been exceptionally supportive, as have the Irish Diaspora Fund and Tipperary County Council. We were hard hit during the downturn but there are some great news stories in this region too. Supermacs recently invested €7m in their new plaza, Tipperary Co-Op will be producing cheese right up until Christmas, such is their demand and there has also been positive news at McMahon’s and in the Technology Park,” Mr Fitzgarald added. It is important that everyone play their part in Tipperary’s recovery and anyone interested in playing their part should attend the launch at the Excel on Mitchell Street from 5pm on the 26th, according to Connect Tipperary’s Willie Ryan. “Everyone in the community, be they a business person or someone with family or connections abroad, has a part to play in bringing our message around the globe. Working together we can really make this pilot initiative work and bring jobs to this region. This won’t happen overnight. There’s a lot of work to be done. But we’re adamant it can and will be done,” he added. 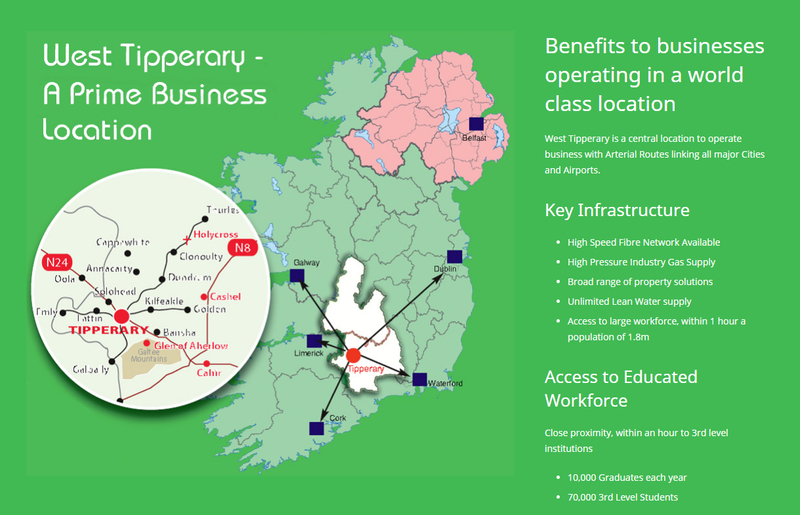 ConnectIreland CEO, Joanna Murphy, says the past 6 months in particular has been phenomenal for the initiative and is very confident that the people of West Tipperary can deliver. “We’ve had a number of meetings with the local community and they all buy in to this initiative. The Chamber, the Council, the GAA, clubs, community groups and individuals in this area are all very practical, very pragmatic and want to make it work. We look forward to helping them make the connections, we’ll help make the introductions and together, we will deliver for Tipperary,” Ms Murphy vowed.